This object is grandly titled, 'Samuel Clarke's Pyramid Food Warmer'. The name describes the way that the three different parts of the food warmer stack on top of each other. The food warmer was in common use throughout the 19th century, and this one dates from the end of the Victorian period. It was usually found in sick rooms where it was used to keep food warm for invalids so that they could eat when they felt able. It also doubled up as a night light for the invalid and the carer to see in the darkened sick room. The food warmer was commonly used to prepare a warm mixture of flour or bread with diluted milk. This was called pap and was fed to babies and invalids. The pap mixture would be put in the ceramic container called a pannikin and covered with a lid. The pannikin sat inside a container of hot water, known as a liner. And both the pannikin and liner sat in a pedestal. A night light at the base of the pedestal heated the water and the food. The food warmer was rather like a modern day steamer, where the cooker heats up the pot of water and the steam cooks the food in the stacked container above. 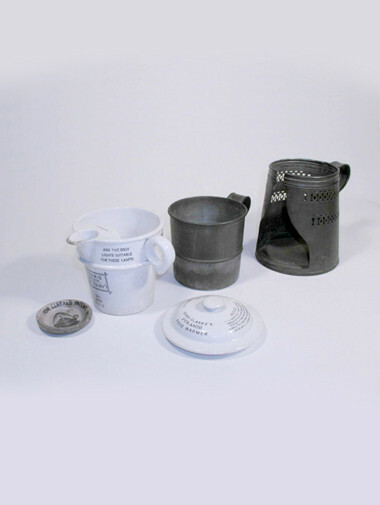 The food warmer was one of a selection of items, including bedpans and sputum (spitting) mugs, sold by chemists for use in the sick room or nursery. Move your mouse over the image for alternative view. The manufacturers wrote on the pannikin as a means of advertising the product and providing directions on its use. The blue writing on the pannikin, all in capitals, includes a poem to advertise Clarke's night lights, a notice about heating milk and cleaning the pannikin, a warning about paraffin lamps, and lastly, the lion and unicorn coat of arms and banner. IN WHICH YOU SEE QUITE NICELY.There was a warning about using paraffin oil in the food burner: 'Caution, Paraffin lamps are very dangerous, And should on no account, Be burnt in this food warmer.' At the end of the 19th century, the majority of households used paraffin or gas lighting. Customers may have been tempted to use paraffin instead of the recommended night lights, because it was readily available. This would have been a bad idea because paraffin was smelly and the fumes would have made the invalid feel even worse. On the side of the pannikin a notice cautioned, 'It is important that the milk should be boiled as soon as it is received from the dairy or it is liable to turn sour.' Milk becomes sour after a few days as the yeast ferments. In 1865 Louis Pasteur demonstrated that heating milk would prevent it turning sour, and would also kill the tuberculosis bacteria. This process was known as pasteurisation. 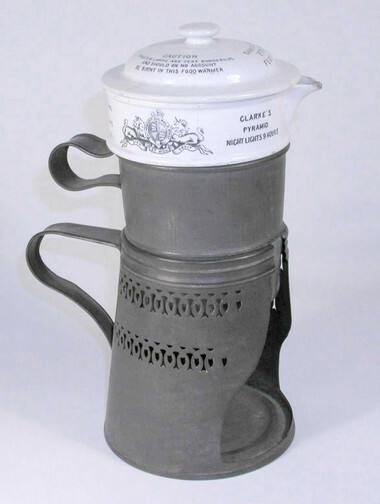 The food warmer was often used in conjunction with feeding boats and feeding cups to serve food to babies and invalids. A wealthy family caring for a sick relative at home would have used the food warmer. Poor families would not have owned a special device to heat food in a small container. Instead, they would have heated food on a stove, or not at all. A type of pottery which is hard and brittle, made by heating clay to a high temperature. A cup with a half-covered opening, a handle and a long spout, which could be used by invalids and infants to take liquid foods. A person who is sick or chronically ill. The part of the food warmer that sits above the night light, and supports the pannikin. It is made of tin, and the container holds water that heats up and therefore warms the food in the pannikin. 1822-1895 - French scientist. He developed the process of pasteurisation to destroy disease-causing bacteria in milk and he invented vaccinations to protect people against viral diseases. The part of the food warmer that contains the food. It sits on top of the liner and pedestal. A mixture of diluted milk and bread or flour, sometimes with other ingredients added. It may be sweetened with sugar. A liquid obtained from petrol and used as a fuel or solvent in heaters and lamps. Also known as kerosene. The treatment of milk to destroy disease-causing bacteria by heating it to a temperature of 60 degrees for 30 minutes. Named after Louis Pasteur, the French chemist who discovered the process in 1865.